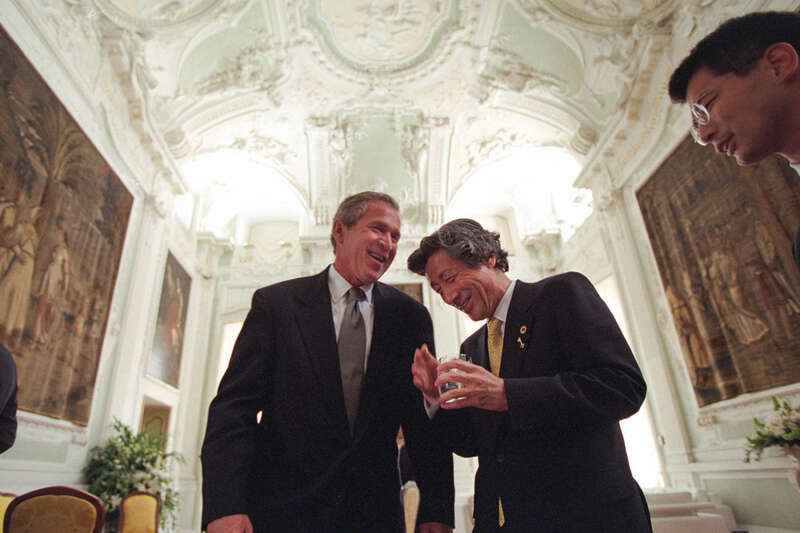 PRESIDENT BUSH GREETS PRIME MINISTER SILVIO BERLUSCONI OF ITALY AT THE PALAZZO DUCALE AT THE START OF THE G8 SUMMIT. THE PRESIDENT GREETS G7 LEADERS AT A RECEPTION: PRIME MINISTER SILVIO BERLUSCONI, ITALY; PRIME MINISTER JUNICHIRO KOIZUMI, JAPAN; PRIME MINISTER TONY BLAIR, UNITED KINGDOM; CHANCELLOR GERHARD SCHROEDER, GERMANY; PRIME MINISTER JEAN CHRETIEN, CANADA; PRIME MINISTER JACQUES CHIRAC, FRANCE; PRIME MINISTER GUY VERHOFSTADT, BELGIUM AND ROMANO PRODI, PRESIDENT OF THE EUROPEAN UNION COMMISSION. PRESIDENT BERLUSCONI FEELS THE PRESIDENT'S ARM MUSCLE AT PRESIDENT CHIRAC AND P.M. KOIZUMI WATCH (JUMBO P5419-8A). THE PRESIDENT TALKS ALONE WITH P.M. JEAN CHRETIEN AS THEY WALK DOWN THE HALL.